Duck Salad w/ Grapes, Almonds, & Blue Cheese + 13 more tasty ways to use DUCK! A lot of people consider duck a "special occasion" meal, often roasting a duck during the holidays, and not thinking of it again for a whole nother year. While duck does make for a very special holiday meal, it's also great on a Tuesday. Duck is extremely versatile, and holds up well to bold flavors. Try it with your favorite spice mix or rub. Still not sure when to use duck? Replace the chicken, pork, or beef in a recipe with duck! Try duck in a curry. Use it as a taco filling. Shred some slow-cooked duck legs and combine with your favorite barbecue sauce for a Pulled Duck Sandwich! Season a duck breast, sear it, and serve it over a salad or rice. Use any portion of cooked duck in a duck salad sandwich or wrap (like the one pictured below made by a local catering company that's filled with duck, pecans, pickles, mandarin oranges, and I think there was even rice in there!). At the beginning of June, I attended the first-ever Blogger Duck University at Maple Leaf Farms right here in Indiana. Although I was already familiar with and using many of their duck products, I discovered so many more ways to season and cook duck while I was there. Watch for a post about my amazing experience at Blogger Duck U coming soon! But today, I really do want you to think about adding duck to your normal cooking rotation. If you're not sure where to begin, Maple Leaf Farms offers some fun (and delicious) duck products that are extremely easy to prepare. I think that they are some great "gateway" duck meal options. From quesadillas to springrolls to potstickers, from Duck Bacon & Sweet Corn Wontons to Duck Wing Drummettes (fully cooked) to the Almond Breaded Duck Tenders that you see on my salad today, you'll find some delicious new flavor combinations and cooking inspiration. And those are just the appetizers. More fully-cooked products that you can choose from are Roast Half Ducks, Rotisserie Boneless Duck Breast, Duck Leg Confit (one of my favorites), fully cooked Pulled Leg Meat (again, yum), and rendered Duck Fat (that would be liquid gold), and another personal favorite, Duck BACON! You can order any of these fully-cooked products online, and they ship to you frozen. So really, if you're new to cooking duck and would like to ease yourself into cooking (and maybe even eating) it, trying a few of these product would be the perfect starting point. I will share more about their raw duck products in future posts. So, it's Tuesday. Noon is rolling around, and you're hungry. You want something quick, something simple, something tasty. 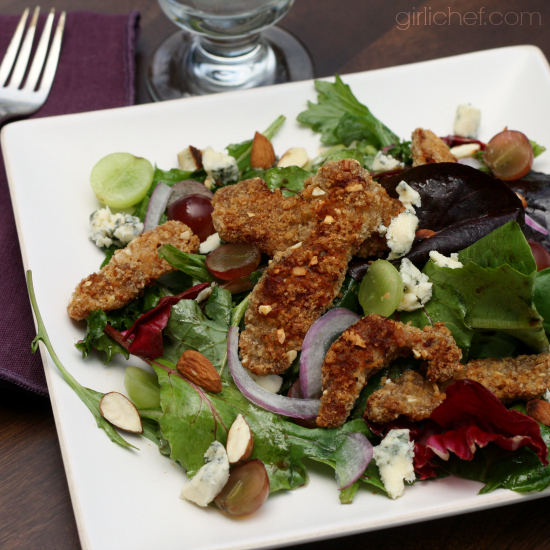 Obviously, you want a cool green salad strewn with juicy grapes, slivers of red onion and toasted almonds, and creamy pungent bleu cheese - topped with duck tenders! It's only a matter of removing a package of Almond Breaded Duck Tenders from the freezer and baking them for 20 minutes. Throw the rest of the salad together while you're waiting and top it with the warm crunchy tenders when they come out of the oven. You just had a simple meal that included duck. On a Tuesday! Duck isn't only for special occasions. 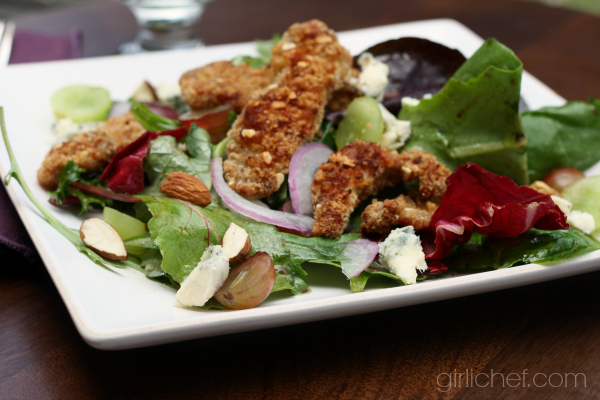 Try topping a salad of mixed greens, grapes, toasted almonds, blue cheese, and red onions with breaded duck tenders for a quick meal any day of the year! Preheat oven to 400° F. Line a baking sheet with parchment or foil. Spread the duck tenderloins out in a single layer on the prepared baking sheet. Slide into the preheated oven and bake for 20 minutes, flipping halfway through. While the duck is cooking, put the lettuce into a large bowl. Add the halved grapes, toasted almonds (chopped a bit, if whole), and red onion. Combine all of the ingredients in a small jar with a lid and shake like crazy. Toss with the salad ingredients in the bowl once the duck comes out of the oven. 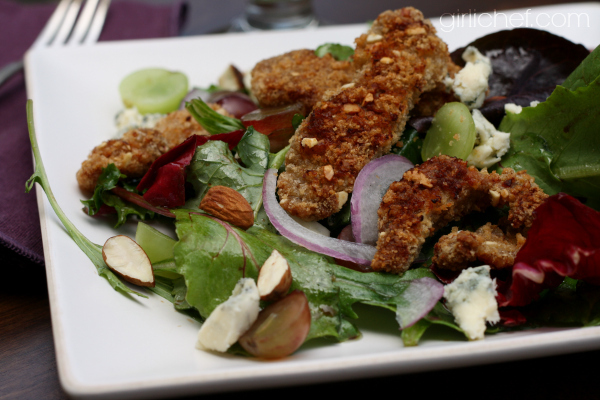 Divide the salad among 4 plates, then top each salad with some of the warm, crispy duck tenderloins and the blue cheese. If you like, crack some more pepper over the top of the salad. Maple Leaf Farms Almond Breaded Duck Tenders are lightly marinated then coated with crunchy Japanese bread crumbs and almond flakes; they are an uncooked product that is sold frozen. *QUACK FACT: Duck is red meat, so a properly prepared duck breast is still pink on the inside! Perhaps you're ready to try cooking duck in your own kitchen on any given day? 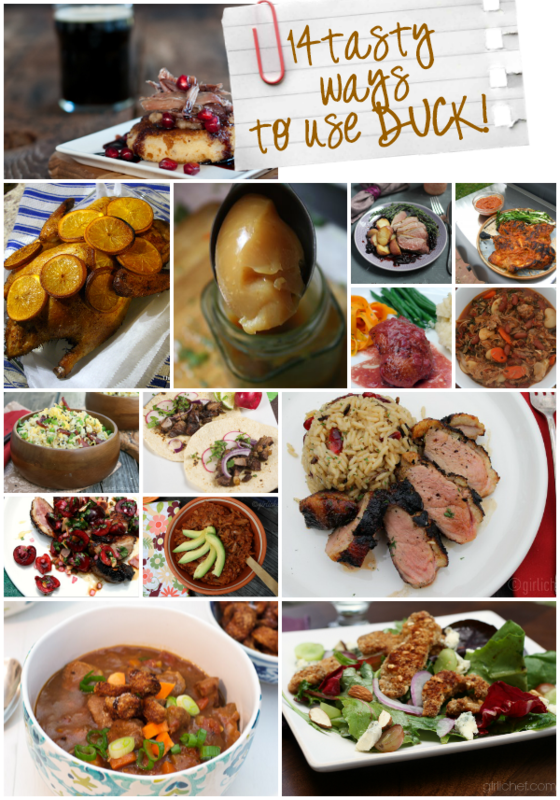 Well, here are some tasty duck recipes, some from right here on All Roads Lead to the Kitchen, others from some of my talented blogging friends, for you to try or be inspired by! If you have any great duck recipes, feel free to leave a link to them in the comments section (one can never have too many duck recipe ideas). Maple Leaf Farms is a local (to me) Indiana business. I've always enjoyed their duck, but after attending their first-ever Blogger Duck University, I was so impressed by their passion, commitment, and quality that I wanted to shout it from the roof tops - so I became a Maple Leaf Farms Brand Ambassador! As a brand ambassador, I receive Maple Leaf Farms duck products from time to time for the purpose of tasting, testing, and sharing. All opinions are my own. Interested in learning more about Maple Leaf Farms duck? You can follow my duck tales, or visit the Maple Leaf Farms website where you can find more duck recipes ideas and purchase products online. You can also connect with them on Facebook, Twitter, Pinterest, Instagram, YouTube, or sign up for their Discover Duck Newsletter.